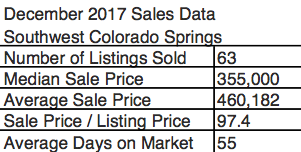 Click here to view historic sales data for Broadmoor and Southwest Colorado Springs. Scroll down to view the latest listings in Broadmoor and Southwest Colorado Springs. The Southwest portion of Colorado Springs offers an assortment of communities suited to any lifestyle. Just outside of downtown and a few minutes south of both Manitou Springs and Old Colorado City, this district combines a wealth of living options with an assortment of activities ready to provide excitement for the whole family. 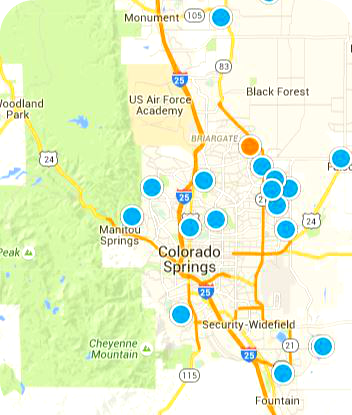 Neighborhoods include Broadmoor, Fort Carson, Ivywild, and Cheyenne Mountain. The Broadmoor Resort opened in 1918, providing guests and local residents with a focal point for community events and entertainment. Today, the resort features three professional golf courses, a full-service spa, three refreshing swimming pools, five world-class tennis courts, and over twenty fitness classes. The twenty-six specialty retail shops located on the hotel grounds include jewelers, galleries, and boutiques that are sure to satisfy any shopping needs. However, the assortment of gourmet and casual dining options are perhaps the most celebrated part of a visit to the Broadmoor Resort. The Forbes Five Star-rated Penrose Room serves seasonally-inspired European cuisine in conjunction with a view of the whole city. The Lake Terrace Dining Room offers a Sunday Brunch buffet with over 150 choices, while the Golden Bee remains the most authentic English pub in all of Colorado. Adventure can be experienced outside of the resort, as well, through a visit to the Broadmoor Seven Falls, a ride on one of the two Cheyenne Canyon zip line courses, or a stay at the Broadmoor Fly Fishing Camp on the Tarryall River. Fort Carson was organized in 1942 as a US Army post and has supported Colorado Springs for the past sixty years. Stationed soldiers and their families can find living accommodations on-post and in the surrounding area, providing opportunities to engage in both military and civilian communities. Seasonal events on-post include the Jingle Bell Run, snowshoeing trips, and NFL games broadcast at The Hub event center every weekend. An elementary school built in 1916 and closed in 2009, the Ivywild School now serves as focal point of the community nestled between I-25 and the Broadmoor. At the school, visitors can grab a cup of coffee at the Principal’s Office, try a snack at the Old School Bakery, sample a spirit at the Axe & The Oak whiskey bar, or experience the beer brewing process at Bristol Brewing Company. Updated homes and apartment complexes are available throughout the area for rent or purchase. The Cheyenne Mountain Resort area offers incredible amenities alongside luxury homes between downtown Colorado Springs and Fort Carson. The hotel grounds include a championship golf course, a thirty-five-acre lake with boating activities, and seventeen tennis courts. Additionally, the Mountain View Restaurant, Elevations Lounge, and Pineview Grille offer dining options complete with views of the Front Range catering to any budget. The entire neighborhood boasts some of the most exciting activities that Colorado Springs has to offer. The Broadmoor World Arena features entertainment and sporting events year-round, while the 291 Distillery, Prime 25, and Edelweiss German Restaurant offer fine drinks and dining to satisfy any palette. Shopping options abound at the Cheyenne Mountain Shopping Center and Broadmoor Towne Center, while the cinema can be enjoyed at any time just around the corner at the Cinemark Tinseltown movie theater. The Cheyenne Mountain Zoo, ranked the 6th best zoo in the nation, offers incredible experiences with wildlife alongside one of the best views on the Front Range. Gold Camp Road provides even more outdoor adventure just west of the neighborhood, leading up through the foothills and into the mountain towns of Cripple Creek and Victor where visitors can experience the rugged history of Colorado. Cheyenne Mountain School District 12 encompasses all of the Southwest portion of Colorado Springs. With over 4,600 students, the school district boasts a college attendance rate of 85% and ranks fifth against all other Colorado school districts. One preschool, five elementary schools, one junior high, one high school, and one charter school work together to provide a productive and achievement-based community. This positive atmosphere reflects in the entire area as Southwest Colorado Springs remains one of the most exciting and friendly areas in the city.